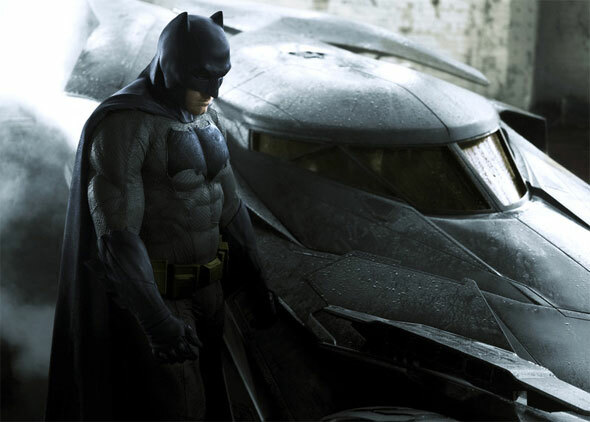 Whilst we’ve seen the black and white photo of Ben Affleck in the new Batman costume, many have been wondering what kind of color scheme the suit will adopt. It has previously been indicated the suit will forgo the ‘black on black’ stylings of previous films in favour of something more grey or even navy. So what the suit looks like, and I was always kind of keeping it quiet until they revealed it, but they’ve revealed it. And you can kind of see, and anybody that… you’ve seen some people take the picture and color it online. In that comic, the suit is a pale gray, the cape and cowl and bat logo are black, the belt is off yellow, and in one panel the cape has a blue tinge to it.